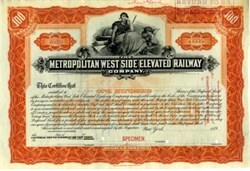 Beautifully engraved certificate from the Metropolitan West Side Elevated Railway Company. 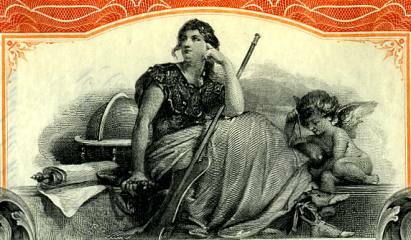 This historic document was printed by American Bank Note Company and has an ornate border around it with a vignette of an allegorical woman sitting on a bench with a cherub on her side. March 9, 1892 - The Metropolitan West Side Elevated Railroad Company (the 'Met') is incorporated. The incorporators had also been involved in the creation of the South Side Rapid Transit Company. April 7, 1892 - The Met is given a 50-year franchise to operate a four-track main line and four two-track branch lines between downtown and Chicago's West Side. August 1893 - The steel for the Garfield Park branch is in place from Paulina Street to Sacramento Boulevard and from Kedzie Street to Douglas Boulevard. Mid-October 1894 - Work on the Northwest branch is completed as far as Robey Street (Damen Avenue). April 1895 - Power to the third rail is turned on for testing and employee training. April 17, 1895 - An inspection trip for company officials, consisting of an excursion train of one motor car and four trailers, starts at Canal Street and covers the main line, the Garfield Park branch, and the Northwest branch as far as Robey Street. May 6, 1895 - Service begins between Canal Street and Robey Street on the Northwest branch. May 17, 1895 - Service is extended to the Met's first downtown terminal at Franklin Street, after completion of bridge over Chicago River. May 25, 1895 - The Northwest branch completed northwest to Logan Square and enters service. June 19, 1895 - The Garfield Park branch enters service to 48th (Cicero) Avenue, even though the line had actually been finished for some time. July 29, 1895 - The Humboldt Park branch is completed to Lawndale Avenue and enters service. April 28, 1896 - The Douglas Park branch opens between Marshfield Avenue junction and 18th Street. August 7, 1896 - Douglas Park service is extended to Western Avenue. January 20, 1897 - The Met is placed in receivership at the request of the West Side Construction Company because of an unmet interest payment of $37,500. October 11, 1897 - Metropolitan "L" trains begin using Loop elevated. The Franklin Street terminal is closed. January 1899 - The Met is reorganized as the Metropolitan West Side Elevated Railway Company with receiver Dirkinson McAllister as its president. February 3, 1899 - The Metropolitan West Side Elevated Railway Company takes over Met operations. June 29, 1900 - The Chicago City Council approved the Met's extensions of the Garfield Park and Douglas Park branches to 52nd and 40th Avenues, respectively, with little comment or discussion. October 5, 1900 - Due to the Loop having reached capacity and a large number of factories who employed many people on the near West Side, the Met began turning some eastbound trains back at Canal Street. A separate stub track and platform extension were built for this purpose. Twelve three-car trains were initially operated in this service; by May 1904, that number would increase to 20 three-car trains. Mid-June, 1900 - Groundbreaking takes place on the two-mile Douglas Park extension from Western Avenue to 40th (Pulaski) Avenue. September 2, 1901 - A fire consumes the entire Logan Square shop building, as well as the station and part of the yard. A more substantial shop building is soon erected and remains in use until 1970. March 10, 1902 - Douglas Park branch service is extended to Lawndale Avenue, activating intermediate stations at California, Kedzie, Homan and Clifton Park (Drake). June 16, 1902 - The Douglas Park branch begins service as far west as 40th Avenue (Pulaski Road). Also opened on this date is the station at Marshall (Douglas Park ) Boulevard. Mid-1902 - The Chicago City Council gives permission for the Met to construct a downtown terminal at Wells Street between Jackson and Van Buren Streets. Work begins shortly thereafter. August 25, 1902 - The Garfield Park line is extended west to 52nd (Laramie) Avenue. On the same day, connecting interurban service is inaugurated on the Aurora Elgin & Chicago Railway between 52nd Avenue and Aurora. Connecting passengers are required to pay a second fare. November 11, 1902 - The Humboldt Park Boulevard station opens on the Humboldt Park branch. Residents along the boulevard had demanded the station because they felt that the neighboring stations - two blocks in each direction - were too far away. Mid-1904 - The Met begins converting its rolling stock to multiple unit control. In July, the first M.U. train entered service. October 3, 1904 - The new downtown terminal at Fifth Avenue (Wells Street) and Jackson Street is put into service for rush hour trains, relieving congestion on the Loop elevated. February 23, 1905 - The Chicago City Council modifies the Met's franchise to allow it to carry trains belonging to surface railroads, allowing the AE&C interurban to use the Met's Fifth Avenue terminal. In return, the Met was required to operate local service between 52nd and Austin Avenues on the AE&C's line. March 11,1905 - Aurora Elgin & Chicago trains begin using the Met's Garfield Park line to gain access to downtown Chicago and the Fifth Avenue terminal. At the same time, Metropolitan Elevated Garfield Park service is extended to Desplaines Avenue in Forest Park, providing local service over that AE&C ground level trackage. March 18, 1906 - A branch off the AE&C's tracks to the Oak Ridge and Mount Carmel Cemeteries opens. Both the Met and AE&C's funeral trains serve this single-track branch on an as-needed basis. A modest passenger service was also run by a single car that met main line trains at Bellwood. May 22, 1907 - Douglas Park branch service is extended to 46th (Kenton) Avenue at the Chicago city limits. The station is a short walk from the Hawthorne Works of the Western Electric Company, as major area employer. December 16, 1907 - Douglas Park branch service is extended to 48th (Cicero) Avenue. It is the first Met station outside of Chicago and the first in Cicero Township. August 20, 1910 - Douglas Park branch service is extended to 52nd (Laramie) Avenue. Summer, 1911 - The first consolidation of Chicago's rapid transit system takes place. The city's four "L" companies (the South Side Elevated Railroad, the Metropolitan West Side Elevated Railroad, the Chicago & Oak Park Elevated Railway and the Northwestern) form a "voluntary association" under the name of the Chicago Elevated Railways Collateral Trust (CER). The CER functioned as a holding company; yielding the benefits of centralized control without dissolving the underlying companies. August, 1911 -The organizational structures of the four "L" companies are overhauled. Samuel Insull is elected as the CER's chairman, while Metropolitan Elevated's president Britton I. Budd is named president of the newly-formed CER. August 1, 1912 - Douglas Park branch service is extended to 56th (Central) Avenue. November 3, 1913 - Crosstown "L" service is instituted and Loop operations are revised. All train begin circling the Loop counterclockwise, with the Met and C&OP [Lake Street] assigned to the Inner Loop track. Free transfers also take effect between the Met and the C&OP where their lines cross at Lake and Paulina. Because the Met already had a Lake Street station there, platforms were simply added to the C&OP's tracks. However, the work was not complete by November 3rd, so walking transfers were instituted between here and the C&OP's Wood Street station for a few weeks. Upon completion, the new Lake Street Transfer station opened and Wood Street closed. August 1, 1915 - Douglas Park branch service is extended to Lombard Avenue. July 1, 1922 - The Aurora Elgin & Chicago Railway is reorganized as Chicago Aurora & Elgin Railroad.